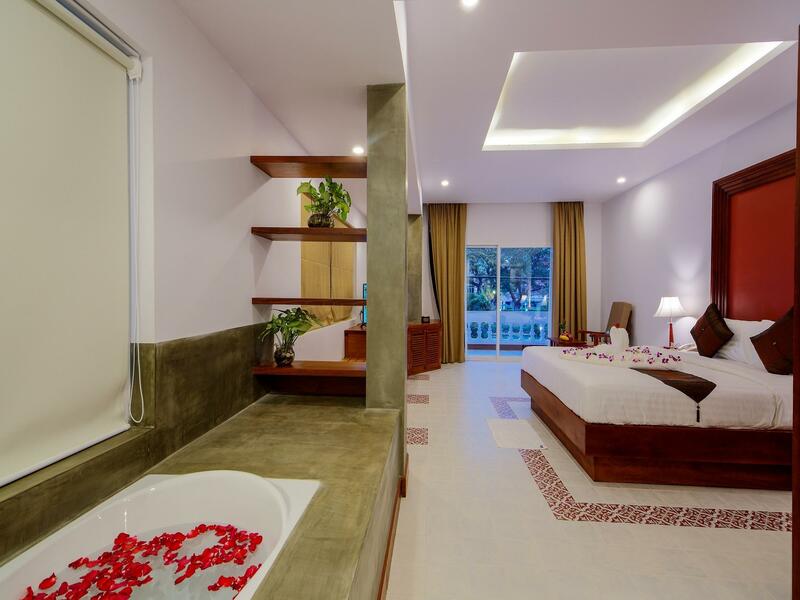 Στην περιοχή Σιέμ Ριπ Κεντρική Περιοχή, το Shadow Angkor Residence αποτελεί ιδανικό σημείο για να εξερευνήσετε την πόλη Σιεμ Ριαπ και τα περίχωρα. Μόνο 5KM μακριά, αυτό το 3.5 αστέρων ξενοδοχείο είναι εύκολα προσβάσιμο από το αεροδρόμιο. Από τη βολική της τοποθεσία, η ιδιοκτησία προσφέρει εύκολη πρόσβαση σε κορυφαίους προορισμούς της πόλης. Οι εγκαταστάσεις και οι υπηρεσίες που παρέχει το Shadow Angkor Residence διασφαλίζουν την ευχάριστη διαμονή των πελατών. Το ξενοδοχείο σας προσφέρει μια μεγάλη επιλογή υπηρεσιών, συμπεριλαμβανομένων των 24ωρη υπηρεσία δωματίου, δωρεάν WiFi σε όλα τα δωμάτια, 24ωρη φύλαξη, ημερήσιος καθαρισμός, ταχυδρομική υπηρεσία. Απολαύστε ανέσεις υψηλών προδιαγραφών κατά τη διαμονή σας. Ορισμένα δωμάτια περιλαμβάνουν επίπεδη τηλεόραση, επιπλέον μπάνιο, επιπλέον τουαλέτα, τηλέφωνο μπάνιου, κρεμάστρα ρούχων - ό,τι πρέπει για να αναζωογονηθείτε μετά από μια γεμάτη μέρα. Εξάλλου, το ξενοδοχείο διοργανώνει πολλά ψυχαγωγικά δρώμενα έτσι ώστε να έχετε πολλά πράγματα να κάνετε κατά τη διαμονή σας. Έξοχες υπηρεσίες και μια εξαιρετική τοποθεσία κάνουν το Shadow Angkor Residence την ιδανική βάση από όπου θα απολαύσετε την παραμονή σας στη Σιεμ Ριαπ. I came in a group of 4 and we took the family room. Room was really clean, spacious and really worth the money spent. They provided basic toiletteries. The staffs always clean the room before noon, thus after lunch outside we will come to the clean room and enjoy our short nap. I really like this hotel, the location was superb and very strategic, its at the center where everything is within reach. The next door supermart was awesome, can find all our needs there. Rows of food in front of the hotel, such a great location. The staffs were really helpful, they will help you as much as possible. In conclusion, I really enjoy my stay here and will definitely revisit here again. Keep up the good job!! Really good and recommended for stay! Stayed for one night. Great location near pub street and the market. Didn't notice much noise at night. Staff were helpful and service was good. Airport pickup was honored as advised, with the driver even waiting an extra hour as our flight was delayed. Pro- old market, pub Street, food stall, night Market, convenient store all just around here. 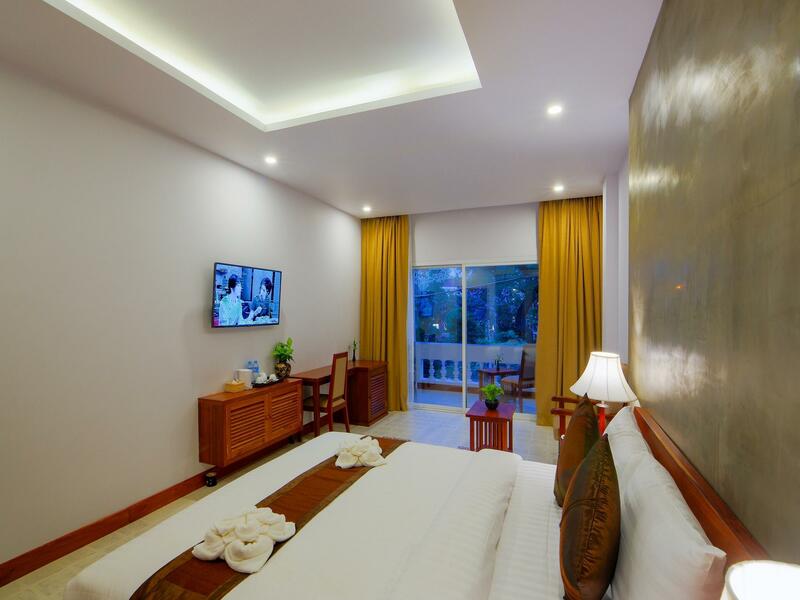 Room is clean and big, staffs are friendly, help us to book tuk tuk and taxi. Cons- night time is noisy with all those music from pub street, restaurant. Family room is at top floor, no lift to access, need to ask hotel staff to help carry the big luggage. Breakfast is very limited choice, ala carte menu and repeat everyday, no aircond at the receptionist and dining area. Good locartion. Pub street, night market, old market etc are just steps away. Room was simple and clean. It wasn’t huge but in reasonable size with a balcony. Service are good. Value for money. The only downside is the bathroom. There was only a glass to keep the shower area half separated with the washroom. The drain of the bathroom was clogged badly. Whole bathroom was flood when taking shower and the water almost went outside to the bedroom. I reported the cloggage but they said all rooms were having this problem as the floor wasn’t in slope. The situation wouldn’t be that worse if the drain weren’t clogged. Application of drain opener to keep water go fast should help the flood a lot. A water barrier on the floor between the shower area and washroom will keep the washroom a bit dry. Anyway it’s a good hotel and I’ll surely return. 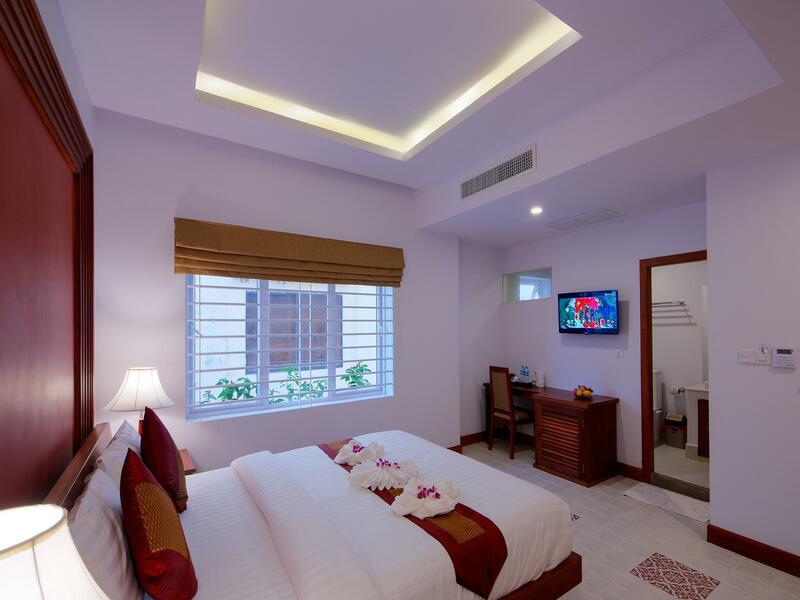 Our family loved staying at Shadow Angkor Residence. The staff and owners are always happy and welcoming and rooms are clean and spacious. Location is the best, right on the river and the shops and restaurants on your doorstep, really easy to pop back to your room for a break. Great breakfast freshly made. The tuk tuk drivers associated with hotel (Wa and his brother) good drivers and I highly recommend. I just don’t have any negatives. We will be back! I booked a room for two adults and two children, and when we arrived there was just one double bed plus a wide bench with a mattress on it. The room seemed set up for only two people (with just two towels and no bedding for the kids, so we asked the guy on reception for an extra duvet and towels, and while we got the towels, he said the store cupboard was locked and so all we got was a couple of thin sheets. In addition, the staff were pretty brusk with my wife at breakfast time, saying that we could only have two breakfasts as we had only booked a two person room. This is most certainly NOT what I booked with Agoda. When I spoke to the owner and another receptionist in the morning, they were both very defiant, asserting that we should have explicitly asked for a spare bed, bedding etc upon checking in. I explained that we did so, but they were not interested, Possibly because there was a lobby half full of guests eating breakfast, hey just wanted to shift the blame on us. Excellent hotel. The room was very spacious and we had our own balcony. The hotel decor was reminiscent of European hotels we've stayed in and it was very clean. Unfortunately no lift but our bags were carried by staff up the few flights of stairs to our room. The staff were very friendly and helpful, with advice on tourist attractions. The hotel was conveniently located to amenities such as late stores and bars. Pub street and the Night Market was a 15 minute stroll away and located nearby was a Hard Rock Cafe and a beautiful temple which was free entry. Well recommended. Pro's - location is the best, on the river with transport food and drink right outside. A seven eleven next door that has a pharmacy section and sells alcohol at very cheap prices. A very short walk you are at the markets and a little more at Pub Street. Room was very clean and the staff were fantastic. Really lovely room, great service, staff that can’t do enough for you, nice breakfast if you go for that option, easy walking distance to Pub st, markets, and lots of places to eat. Ideal place for anyone to stay. Only very minor negative is that the room got covered in bugs, but this is relatively normal in Cambodia, and was quickly solved by the staff. The hotel is vary close to Pub street and old market. You can walk just 5 mins back to hotel. Even it is close to pub street but it is not loudly at night. Nice, friendly and English speaking staff, valuable to stay. Easy to find Tuktuk to go Angkor Wat, Angkor Thom or any where you want. The street foods, fruit smoothies and Roti are good, they are just across the street in front of the old market at night. arrange a free airport pickup which is nice for single traveller... staffs are nice and helpful, however, there are lots of mosquito inside the room when I just arrive... luckily the staff remembers to apply mosquito spray when I left for dinner... and I can have good sleep afterward. remember the staff apply mosquito spray before the guests arrive for better experience. 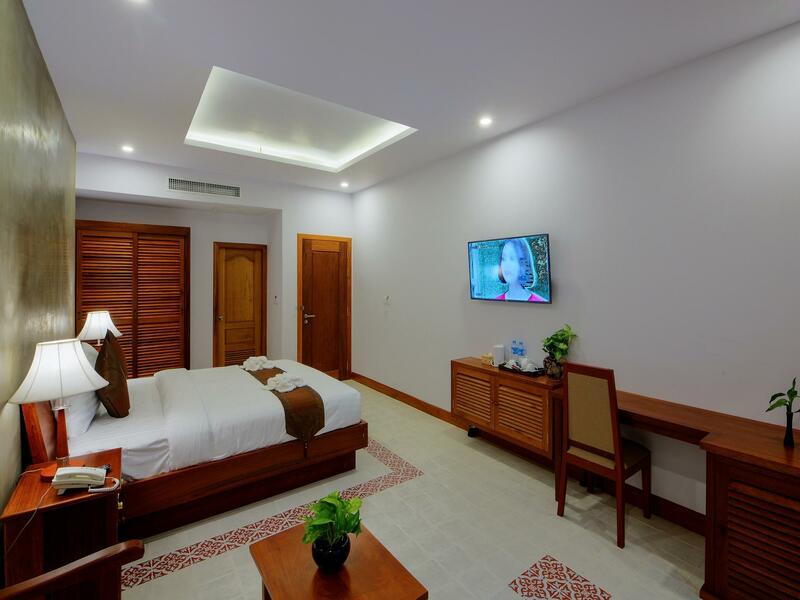 In a old colonial building, this small hotel is very well placed near the old marked and quarter. Staff is very friendly and use nice tuk tuk driver to see the temples (my was Sokha). Absolutely loved our stay at Shadow Angkor Residence and would definitely stay here again. 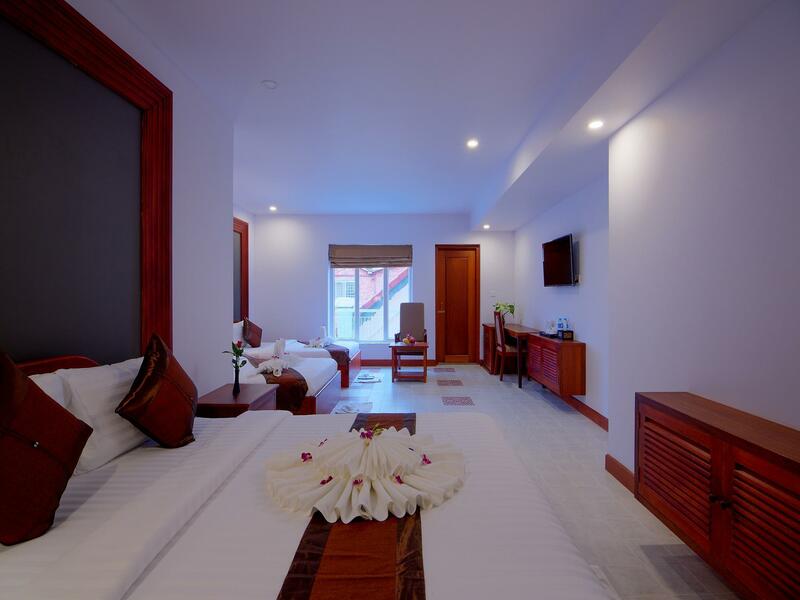 Spacious rooms, clean, and very helpful staff. Perfect location, and very easy walk to the old market and the pub street. 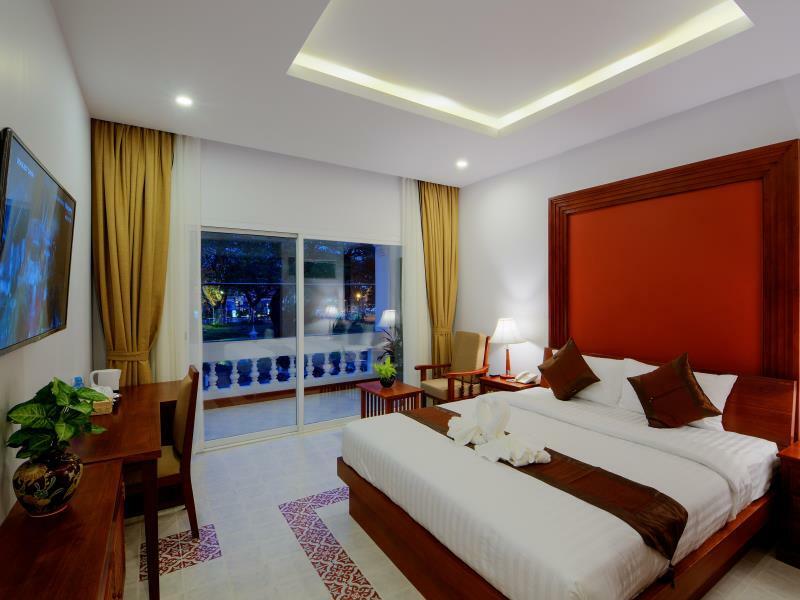 Highly recommend staying here while in Siem Reap! Very good value for around $30 a night. Very nicely finished. Well located right in the centre on the river and near to main touristy area . Lots of shops, eating places, bars, on your doorstep. Extremely comfortable room. Great bed, bathroom and powerful air con. Balcony. Excellent service and very friendly staff. Ask them to arrange a tuk tuk to Angkor. I had Wa as a driver. He did a great job . Only negatives are that the area is noisy because it is so central and busy. Wifi struggles on the balcony. No easily accessable power points in the room. Pretty minor.